Vobot is a small wireless button that you can talk to. It's a versatile AI device. Also it helps connect your family by voice messages. "Turn on the light of living room"
Hold down the Vobot button and speak your message. When you let go of the button, a voice message will be sent to your family group. Simply use another Vobot or iOS/Android APP to read it. Vobot is a stand-alone device with built-in WiFi internet connectivity and needs no bluetooth/smartphone to pair with. 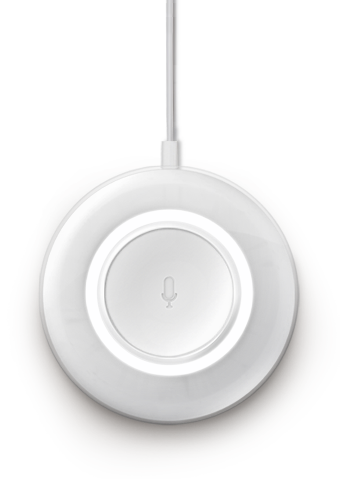 Vobot is a hands-free, voice-activated device. Just say the wake word "Hey Alexa" and it responds instantly (works great within 5-feet). Stop paging through smartphone screens to find a controller APP. Just ask Vobot to switch on a lamp, turn on the fan, dim the lights, or increase the temperature. Vobot will unifying and controlling almost everything using your voice. With over 100+ partner products and IFTTT, there is no limit to what Vobot can do for you. Just ask Vobot to switch on a lamp, turn on the fan, dim the lights, or increase the temperature. Vobot will unifying and controlling almost everything using your voice. No more texting and yelling to get your family down to dinner. With future firmware upgrades, Vobot can work as a WiFi doorbell. When a visitor presses the button, you can hear and speak to the person at the door whether you're at home, at work or abroad. No more texting and yelling to get your family down to dinner. Multiple Vobots can be deployed in the house, enabling a room to room, home to home audio intercom or PA system. Vobot can work as a WiFi doorbell, you can hear and speak to the visitor at the door whether you're at home, at work or abroad. Connect Vobot to external speakers with 3.5mm stereo output, it will double as an Internet radio and a WiFi audio adapter. You may enjoy music from Amazon Prime music, Spotify, Pandora, iHeartRadio, TuneIn, or even from your iPhone/iPad/Android devices. 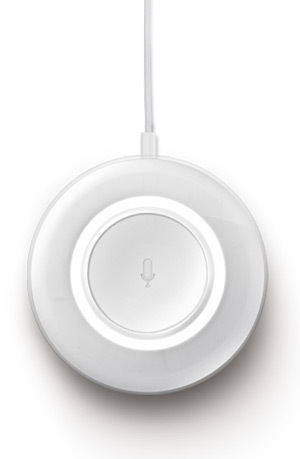 Vobot includes built-in 2W speakers so it can work on its own as a smart alarm clock and story-teller in the bedroom. Connect Vobot to external speakers, it will double as an Internet radio and a WiFi audio adapter. You may enjoy music from Amazon Prime music, Spotify or your iPhone/iPad/Android devices. Vobot has build-in speakers so it can work on its own as a smart alarm clock and story-teller in the bedroom. Early adopter, be one of the first! Connectivity Supports 2.4GHz 802.11b/g/n Wi-Fi networks. Does not support connecting to ad-hoc (or peer-to-peer) Wi-Fi networks. Audio Built-in speaker for voice feedback when not connected to external speakers. 3.5 mm stereo audio output for use with external speakers. System Requirements The Vobot App is compatible with Android (4.4+), and iOS (9.0+) devices and also accessible via your web browser. Certain skills and services may require subscription or other fees. Included in the Box Vobot, USB cable (6 ft.), and Quick Start Guide. Power Supply 5V/1A USB Adapter (sold separately). Current model has no battery build-in. Vobot devices and Vobot APPs(iOs or Android) can be connected altogether over Internet. You can give customized names and aliases to each device so as to make managing and calling between the devices easy. To get more members and devices involved, you can even create chatting groups. Like whatsapp, People can send voice or text messages anytime anywhere. Vobot will alert and playback. On Vobot side, just like a Push-to-Talk walkie-talkie, hold the Vobot button and speak, release the button when finished. Message will be sent to a chatting group or an individual contact. "Send Message to Daddy, Buy me a new toy, please..."
"Send Message to Michael, Remember to buy the milk." By default Vobot will send messages to a previous group or receiver, or response to a sender, until you specify a new receiver explicitly (a built-in voice recognition engine will identify it and confirm with you). Why is the sky blue? / What's the square root of 64? / Wikipedia: "Boardwalk Empire." / How far is it from here to the North Pole? What’s on my calendar tomorrow at 9 p.m.? / Add "Buy groceries" to my calendar for Saturday, February 27 at 3 p.m.
What's popular from Regina Spektor? / Play samples by the Beatles. / Buy "Wrecking Ball" by Miley Cyrus. What Mexican restaurants are nearby? / Find the address for a nearby pharmacy. / Find the hours for a nearby bank. What’s my commute? / How is traffic? / What’s traffic like right now? What's the weather? / Will it rain tomorrow? / What's the weather in Los Angeles this weekend? / What's the weather in Dallas? / Is it going to snow on Monday? What movies are playing? / Tell me about the movie "The Revenant." / What action movies are playing Saturday night? What's my Flash Briefing? / What's in the news? Did Chelsea win? / When do the Seattle Storm play next? / How are the New York Rangers doing? Add "bread" to my Shopping list. / What's on my Shopping / To-do list? Alexa, play some jazz from Prime Music. / Play music by Icona Pop. Play the station NPR. / Play the program Radiolab. / Play Fox Sports Radio on iHeartRadio. Reorder AAA batteries. / Add coffee filters to my cart. Wake me up at 6 in the morning / What alarms are set for tomorrow? / Snooze / What time is it?